With the summer heat in full force, I’m spending a lot of my free time out in the garden, floating around the pool in my cool new donut float, working on DIY projects, and spending as much time as possible outside. This summer has been a great one with trips to amusement parks and water parks, and a trip to Denver. As I get busier and the temperatures get warmer, I start to struggle with my diet. I want lighter foods (except chips, I love chips) and most of the time I want something quick. A luncheable is quick but tastes horrible and somewhat stale. I like salads but those get old, and I can’t eat yet another turkey sandwich. Guys, the struggle is real! A few months ago I took a summer roll class and I was hooked. These rolls are light and tasty and you can put anything you want into them. After I learned the technique, I realized I probably didn’t need to take the class but it was fun!! In class, I learned how to make a few of the great sauces they had but I ran into a problem: they had a lot of ingredients. Honestly, it wasn’t something I want to do for a quick lunch. So I went on a search for a peanut sauce recipe that was rich and creamy and wasn’t a lot of work. I came across White on Rice Couple’s recipe and made it in about two minutes! The second time I made it, I added my own little touch: red pepper flakes for a bit of a kick to it. You can get most of the ingredients at your local supermarket. The rice paper is the trickiest item to find but I found some at the Asian market. You can find them on Amazon too (they are more expensive though!). 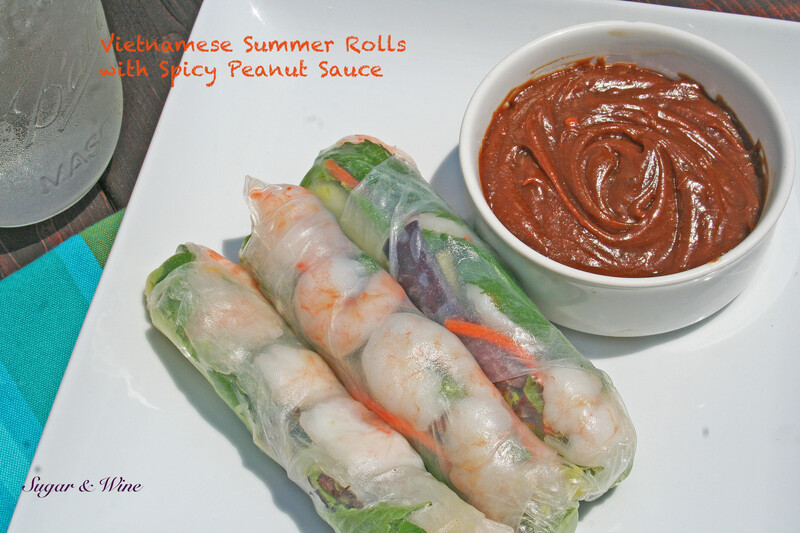 Here’s what I put in my summer rolls but there are tons of options and I’ll post more as the summer goes along. **You can totally add in vermicelli noodles or rice for a little more substance but in the summer I am omitting them to make them lighter. Start with the sauce so that everything is ready to go when the rolls are finished. In a small bowl, combine the hoisin and the peanut butter. Once combined, add the rice vinegar and sesame oil. The final ingredient added is the red pepper flakes. Stir all of the ingredients together and set aside. Next, take a plate with a little bit of a lip and put in enough water to dip the rice paper into. My plate was a little deeper so I used almost a 1/2 cup of water but the amount will range from about 1/4 cup to a 1/2 cup. When the rice paper gets wet, it will need a ledge to pull it off your surface. I personally use a large cutting board and place the wet rice paper just slightly off the surface. Let it soften for about a minute and it’s ready to for filling. The ingredients should be placed in the bottom fourth of the rice paper so that there’s enough room to roll and tuck the paper. I start with the pretty ingredients to make the rolls look nice but there’s no real order to filling them. Just don’t over fill or they won’t stay closed. Once you have your ingredients, it is time to roll them. Lift the bottom piece to cover the ingredients, and roll. After one roll over, you want to fold in the ends, and then continue to roll the ingredients until it is completely rolled. Repeat for the number of rolls you want. I usually eat 3 for lunch but adjust for your appetite. Then, guess what? You are done. Enjoy!